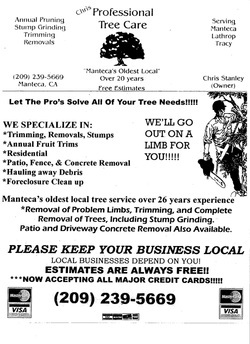 Welcome to the all new website of Professional Tree Service, aka Chris' Professional Tree Care located in Manteca, California since 1988. We are the number one licensed tree service providing reliable, prompt, friendly, and skilled tree care to our local customers here in Manteca, Lathrop, Ripon, Tracy, French Camp, and Weston Ranch. We are proudly family owned and operated. We support our local businesses and appreciate that you are also doing the same to help our local businesses as well. We look forward to meeting with you to discuss the services you may need. You may have seen our flyer which we send out annually in the Manteca Bulletin on New Year's day as shown to the right of the page. We do this as a reminder to our customers to call for their annual tree care needs for over 22 years now. We have been trusted by homeowners and business owners for over 22 years to handle all aspects of tree care whether it be simple stump grinding, tree removals, trims, or emergency storm damage. There is no job to big or small.